The most amazing t-shirts designed by Sandyspider Stores on Zazzle, Etsy and Sandyspider on Amazon. Even more amazing are the popular and trendy shirts by Marvel Comics and Disney. (My favorites of those near the bottom of this article.) Presently it is Cyber Monday. T-Shirts on Zazzle are up to 60% off today. The deal of the day sale starts: 11/27/2017 Expires: 11/27/2017 11:59 PM PST. See the special promo code at the end of this page. (Note that the colored text is clickable and leads to either to the product sites.) If you came here after the special sale, click on any of the links and products to see what deals are available. Most clothing on Zazzle is interchangeable. Meaning, on the right of the individual product page there is a pull-down under "Style". You can change the style from “Men” to "Women” or "Children". Change from a t-shirt to a sweatshirt, hoodie or t-shirt dress. Choose any of the sizes listed. Personalize the template with your own text. Customize in most cases to exchange or resize the image. Though re-sizing the image too large can result in a blurred image. Watch for the yellow warning triangle. Here are some new and popular t-shirts from my stores. On sale now, get fun and original designed t-shirts for him or her at 2BuyTees on Etsy. Sign in as a guest and order a quality cotton blend shirt today. Make a political statement. Buy t-shirt tops for the bridal team. A special Christmas t-shirt. Or a funny monster shirt to reflect the way you do before that cup of coffee. Get these amazing t-shirts designed by Sandyspider Shirts on Amazon. This is a small selection for shirts for youth to adult. Long sleeve (adult sizes only) and short sleeve t-shirts (youth and adult sizes). Get free shipping with Prime membership. If you don’t have it, then you can try it for 30 days free. Click here to get Amazon Prime Now . The long sleeve t-shirts are made of the same quality brand as the short sleeve. These are priced to sale. I personally bought a couple of the shirts and love the soft comfortable feel. The printing on these t-shirts are excellent. 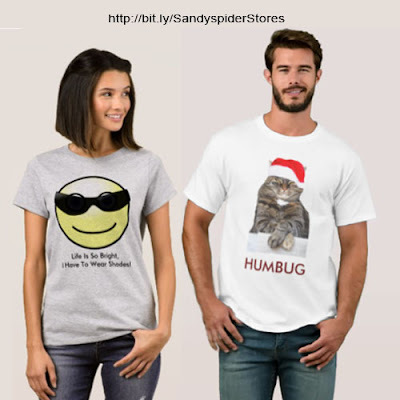 More Amazing Sandyspider T-Shirts on Amazon. Find these and more within this leggings collection here. Intro photo on Polyvore. Products shown from image are located here below.